Lucien Buysse, 11 September 1892 – 3 January 1980, was a Belgian cyclist and winner of the 1926 Tour de France. Lucien Buysse was born in Wontergem Belgium in 1892, Buysse started racing as a professional in 1914, in which year he rode his first Tour de France. He comes from one of cycling’s great families, with 3 brothers, 3 sons and 3 nephews who have all raced as professionals. He was winner of the Tour of Belgium in 1913 and this prompted the move to be a professional. He resumed his cycling career in 1919 after the First World War and again like 1914 rode but failed to complete Le Tour. 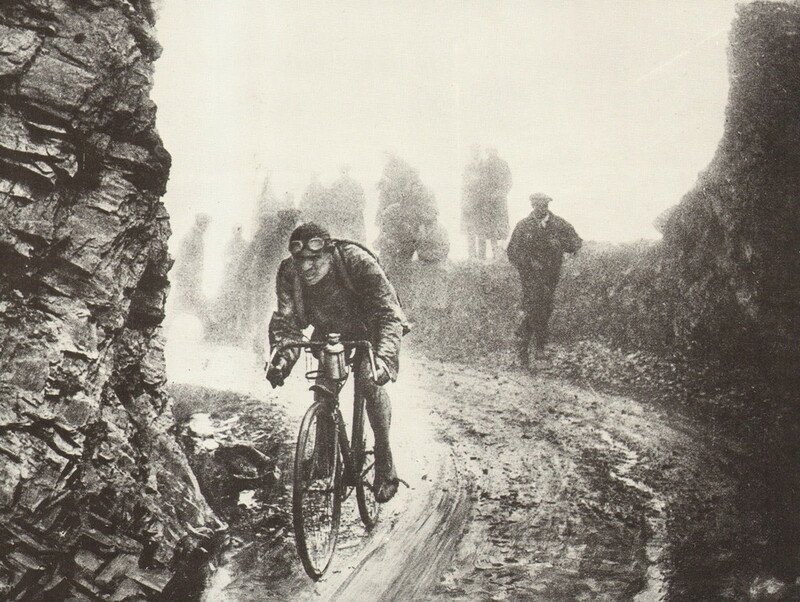 In 1920 he finished 7th in Tour of Flanders, 3rd in Paris–Roubaix and second in Liege-Bastogne-Liege. 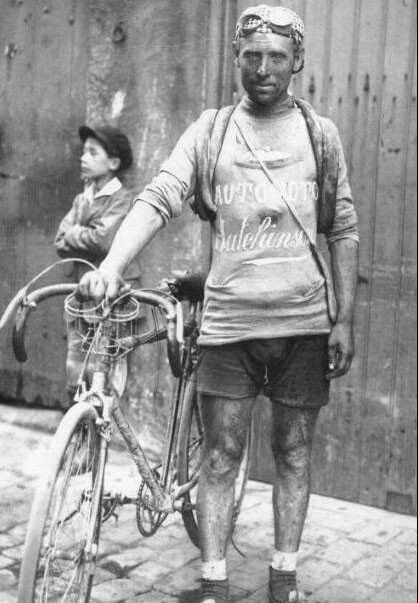 In 1921 he rode his only Giro de Italia and finished 4th. 1922 seems to have been a lean year with few notable results, victory at a race in Lier in Belgium and 5th in Tour of Flanderes. The 1923 season was the start of his best years of racing which would reach a peak in 1926 with victory in Le Tour. He won the Six Days of Ghent and the Critérium d’Amsterdam. Lucien won the 8th stage of the Tour de France and was a top ten finisher in 7 other stages. He finished Le Tour in 8th place on GC. 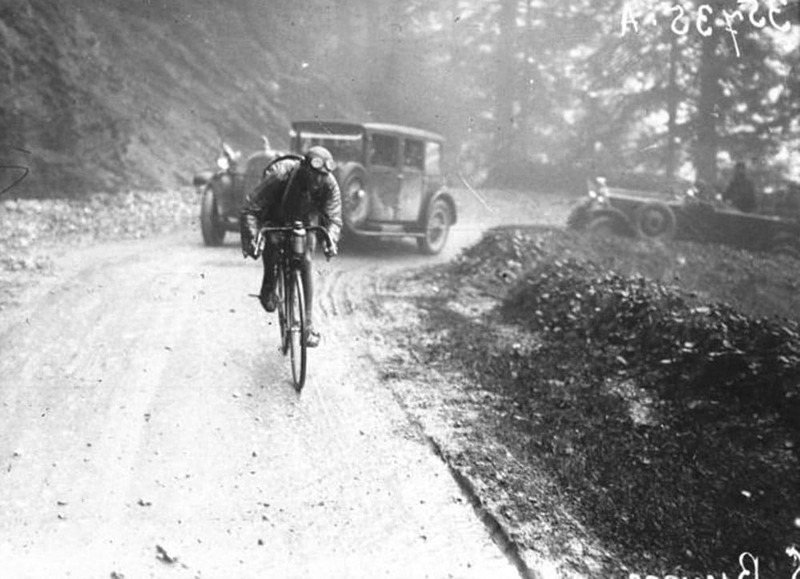 In 1924 he failed to win a stage but he had 6 top ten finishes and ended 3rd overall. The following year he went one better finishing 2nd on GC. Lucien also won 2 stages and finished in the top 10 on 13 stages. The year 1926 was to be his big year. It is a remarkable tour and a remarkable winner for a number of reasons. It is the longest tour in history, with 5745km over 17 stages averaging 338km each and an average speed of 24.1km per hour. Many would argue that it was the hardest tour ever and that stage 10 from Bayonne to Luchon was the hardest stage in history. It was stage 10 that made Lucien Buysse a legend of Le Tour de France. 126 riders started, 44 on sponsored teams and 82 independent (touristes-routiers) with only 41 finishers. Lucien Buysse rode on the Italian trade team Automoto along with his brother Jules. The team was led by Ottavio Bottecchia the winner of the previous two tours. The Automoto team had pioneered the tactic of using a domestic, whose sole role in the race was to help his team leader. Bottecchia being leader and Buysse being the first domestic in cycling racing, it had been highly successful winning the tour for Bottecchia twice and in 1926 it was expected that he would win a third straight victory, with Lucien Buysse sacrificing himself day after day for his leader. It is still the main tactic for any team hoping to win in the 21st century. It was the first Tour to start outside Paris. The riders were shuttled by train to the alpine town of Évian, on the shore of Lake Geneva. Tour director Henri Desgrange hoped to have a more aggressive and exciting Tour by starting in the mountains, and having only a few flat stages before the finish in Paris. Clearly he got the maths wrong as 10 of the 17 stages ended in a sprint. Apart from the Automoto team only the French team Alcyon, were seem as being strong contenders for the overall victory. They had Bartolomeo Aimo and Nicolas Frantz, third and fourth in 1925. They also had Adelin Benoit, the highly rated Belgian who had cracked the year before in his effort to overhaul Bottecchia. Tour director Desgrange believed that Benoit would be the real challenger to Bottecchia’s 3rd straight victory. It was a mixed result for the Automoto team with Jules Buysse taking victory by 13 minutes from a chasing group of 9 riders. Their star rider, Bottecchia finished 16th, 34min and 17sec behind his team mate Jules Buysse, and 10 minutes behind 15th placed Lucien Buysse in what seems to have been a team free for all. Jules Buysse would wear the yellow jersey the following day. 15 riders had abandoned on the stage, the last finisher was 4:52:17 behind. Gustave Van Slembrouck won the stage and took the yellow jersey having beaten the top riders to Dunkerque by over 10 minutes. It was in Dunkerque that Lucien Buysse got the terrible news from Belgium of the death of his daughter. He decided to quit the race to return home but was persuaded to continue by his brothers and other family members. He pledged that he would win the Tour in the Pyrénées. Some accounts say that his daughter died on this day, in fact she had died before the start of the Tour with the news only reaching Lucien when he arrived in Dunkerque. There would be no significant changes until stage 10 as the next 6 stages ended in bunch sprints. This stage was a bunch sprint contested by 56 riders, a bunch gallop that was unheard of at that time. This would be the stage that would change everything, the stage that Lucien Buysse would win the Tour de France and the stage long remembered as the most brutal in Tour history. Lucien started with a 22 minute deficit on yellow jersey Gustaaf Van Slembrouck. The weather that day was hellish, heavy rain from the start and freezing fog on the mountains. The roads became rivers of mud and the riders crossed the Circle of Death, Col d’Ousqich, Col d’Aubisque, Cirque du Litor, Col du Soulor, Col du Tourmalet, Col d’Aspin and Col de Peyresourde. 326km with 6000m of climbing. Hell indeed! 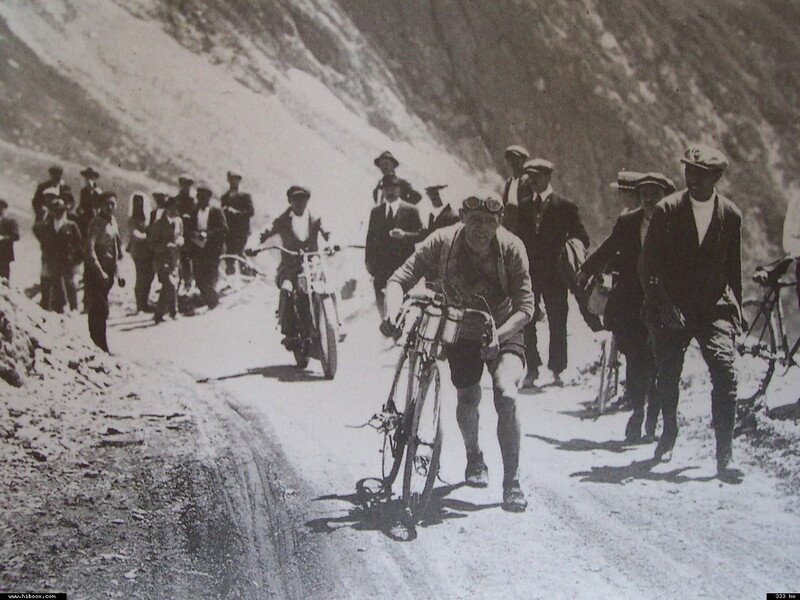 Lucien Buysse on Cirque du Litor on stage 10 of the 1926 Tour de France. The race started at 02:00 in the night, wind and cold rain were beating off the Atlantic ocean. The riders proceeded at a good pace towards the high mountains. At the bottom of Col d’Aubisque the real racing and suffering started when Lucien Buysse attacked, pulling clear of the bunch with Albert Dejonghe and Omer Huyse. Bottecchia was immediately dropped but soldiered on. Desgranges favorite Benoit abandoned shortly after the start. As the leading group of 3 approached the summit they were forced to get off and push their bikes as the wheels were sinking into the mud. A biting cold sleet was beating into their faces. At 1709m altitude the col d’Aubisque is high but ahead lay the Tourmalet, 500m higher and temperatures below freezing. On Col du Tourmalet, Huyse was dropped and Buysse and Dejonghe were joined by Odile Tailleau, Léon Devos and Bartolomeo Aimo before the summit. It was very cold and the rain and sleet fell by the bucketful. This group descended together to the start of Col d’Aspin where Buysse attacked again, as the mountains reverberated to the flash and crack of thunder and lightening. This time he rode off up the mountain on his own. 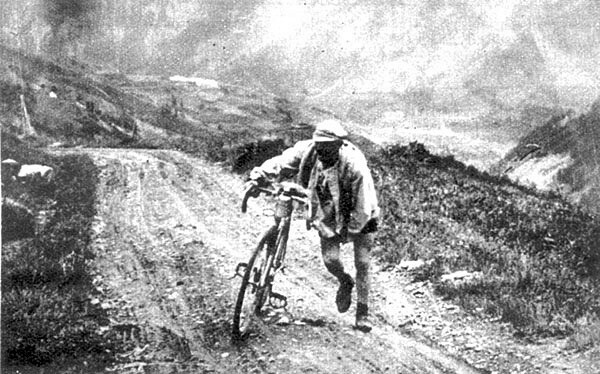 He opened the gap further on Col de Peyresourde, arriving in Luchon at 19:17 in the evening 17hr 12min 04sec after leaving Bayonne. 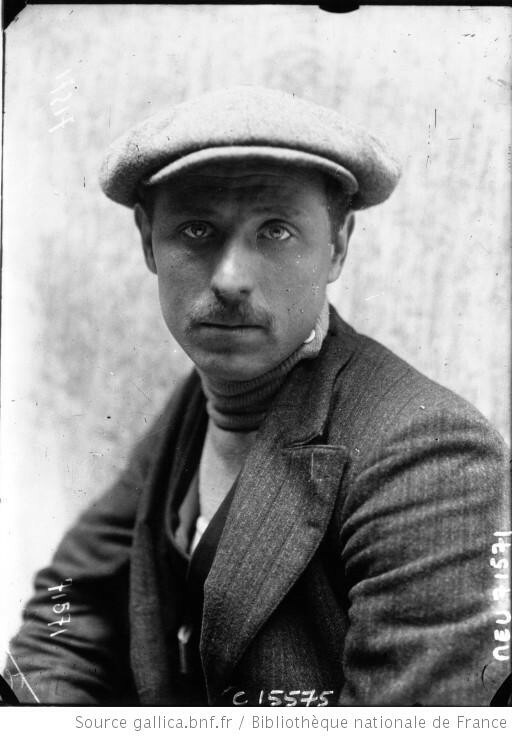 He became the 3rd Buysse brother to lead the Tour de France after Jules a week earlier and Marcel in 1913. Aimo came second 24min and 48sec behind. Van Slembrouck lost 1hr 50min, the yellow jersey and any hope of victory. Desgrange doubled the time cut-off to 40% of the winner’s time. At midnight Tour officials rescued several riders from the Peyresourde, freezing cold and starving with hunger their Tour was over. Of the 76 riders to start the stage only 54 would ride into Luchon, among those to abandon on Peyresourde was Bottecchia, he would never ride another Tour. The last rider to finish was Fernand Besiner, 5hr 34min 1sec behind Buysse. The winner’s average speed was an incredible 18.9km per hour. Even today with tarmac roads and fancy carbon bikes, it takes a very good rider to cover that route at such a speed. Ottavio Bottecchia was murdered in Italy in 1927. He was out on a training ride when he was attacked. His bike was found a few meters from his lifeless body. Nobody was ever found for the murder, it is believed he was killed by the Fascists as he was a socialist, his brother would also be murdered in the same area two years later. This was another savage hard stage with Col d’Ares, Col de Portet d’Aspet, Col de Port and Col de Puymorens and Col de la Perche before the long descent to Perpignan. The weather had improved considerably and the Buysse brothers stamped their superiority on the stage from the start. Lucien won again after a 150km solo breakaway. He increased his lead to over an hour. Jules crossed the line in second place, 7 minutes later. Effetively the Tour was now over; there were no real changes through the Alps, even the hardest alpine stage finished as a bunch sprint. Lucien simply protected his lead to Paris. 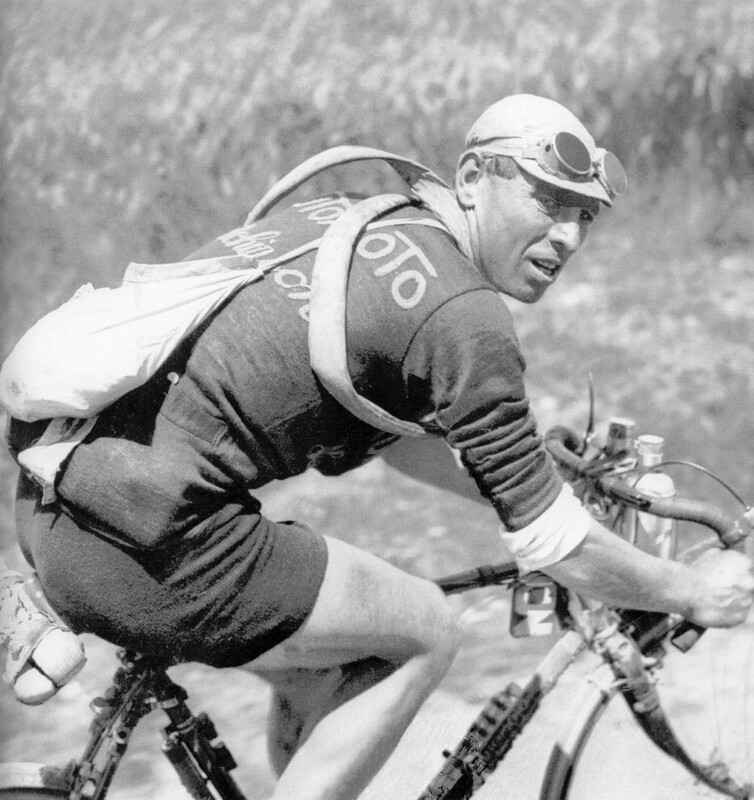 Lucien never finished the Tour again and retired in 1930 after 13 years as a professional cyclist. He lived in the Belgiun town of Deinze where he was proprietor of a café which he called “Café Aubisque”. He died in 1980. 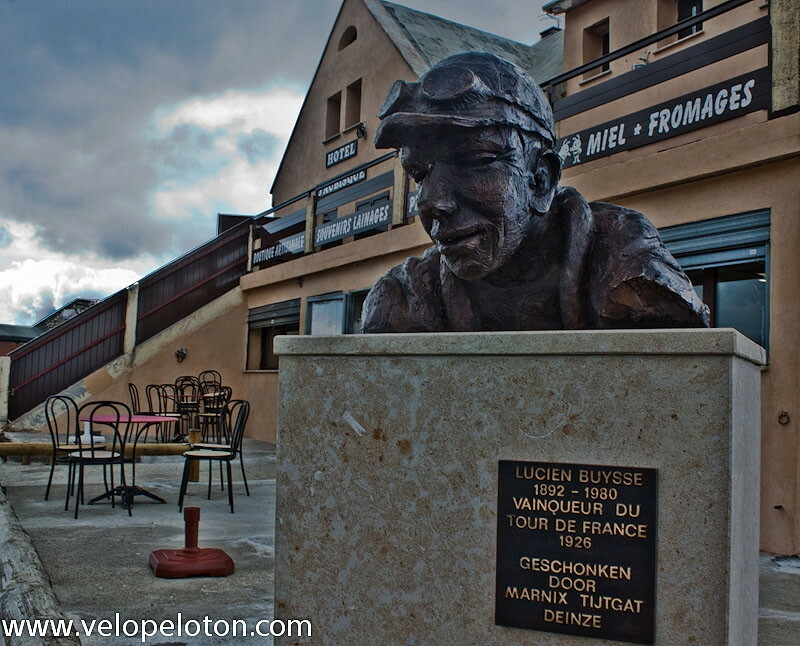 Bust of Lucien Buysse at the Café on Col d’Aubisque. 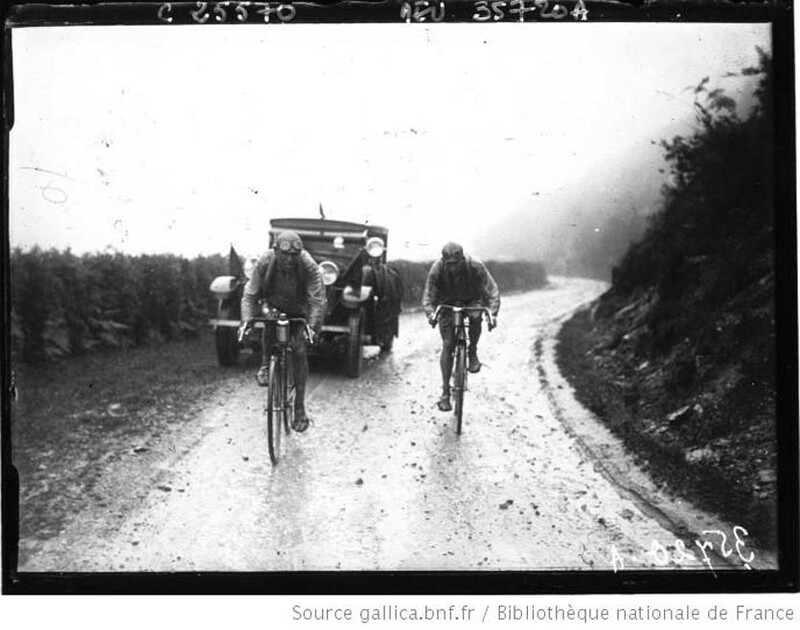 Bayonne to Luchon, 1926 Tour de France, Lucien Buysse climbing col d’Aubisque.